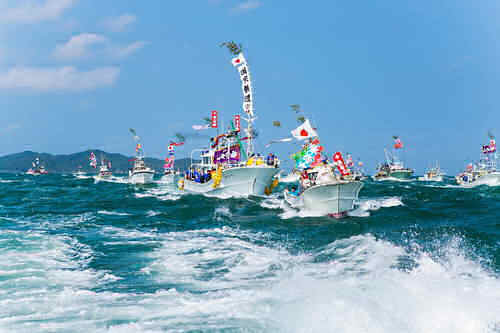 Located 60 km off the western coast of Kyushu island, the island of Okinoshima is an exceptional example of the tradition of worship of a sacred island. The archaeological sites that have been preserved on the island are virtually intact, and provide a chronological record of how the rituals performed there changed from the 4th to the 9th centuries AD. In these rituals, votive objects were deposited as offerings at different sites on the island. Many of them are of exquisite workmanship and had been brought from overseas, providing evidence of intense exchanges between the Japanese archipelago, the Korean Peninsula and the Asian continent. 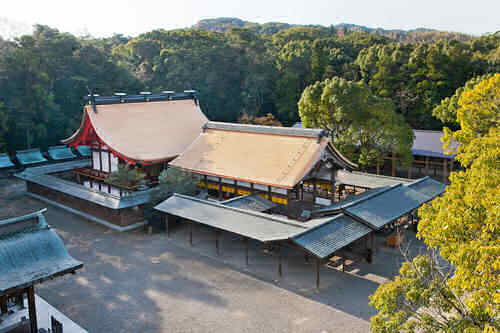 Integrated within the Grand Shrine of Munakata, the island of Okinoshima is considered sacred to this day. 큐슈 섬의 서부 해안에서 60km 떨어진 곳에 있는 오키노시마(沖之島)는 성스러운 섬을 숭배한 일본인들의 전통 신앙을 볼 수 있는 탁월한 사례이다. 오키노시마에 보존된 고고 유적지들은 사실상 거의 훼손되지 않았고, 서기 4세기부터 9세기까지 있었던 제례의 변화를 그대로 보존하고 있는 연대기적 기록이라고 할 수 있다. 제례 때 사용된 제물들은 섬의 여러 곳에 받쳐졌는데 그 중에는 훌륭한 기술과 예술적 가치를 지닌 공예품이 상당히 많으며 해외에서 들여온 것도 있다. 때문에 오키노시마에서는 일본이 한반도 및 다른 아시아 대륙과 활발하게 교류했던 증거를 찾아볼 수 있다. 무나카타(宗像) 신사와 통합된 오키노시마는 오늘날까지 신성한 곳으로 여겨지고 있다.